(Newser) – A Prairie Home Companion is changing its name to Town Hall after an allegation of workplace misconduct was made against former host Garrison Keillor. The man who replaced Keillor as host of Prairie Home after Keillor retired last year announced the show's new name Saturday, the AP reports. Chris Thile also addressed the allegation against Keillor during the opening minutes of the radio show's first broadcast since news of the allegation broke. Thile said the allegation came as "heartbreaking news." Minnesota Public Radio, the parent company of the show's distributor, ended its relationship with Keillor over the allegation. The network did not give details of the alleged misconduct. 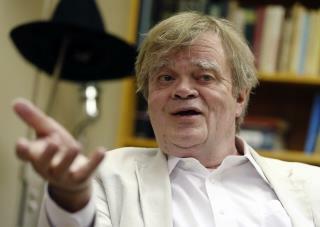 Keillor says he touched a woman's bare back as he tried to console her, and that he apologized. Thile says the US is in the midst of a movement he believes represents progress. He says people are recognizing the "harmful power imbalance that women have had to endure for so long in our culture." Innocent until proven guilty....or at least until someone accuses you. "harmful power imbalance that women have had to endure for so long in our culture." I love it on top.Yay us! Hang the predators' asses. But prove guilt FIRST.......then fire them.